So the boys are now nearing the end of week two of their summer holidays....the pace has definitely slowed a lot and relaxing the routines has certainly been welcome. With dog-walking normally done while the boys are in school, Chester's walks have been varied and noisier recently! Yesterday, to ring the changes, we invited some family for a high-tea......I do love to sit and look through my cookbooks and plan a meal or party......aside from eating, it is one of my favourite things to do.....maybe it is the anticipation of the eating! Needless to say, it tasted jolly good and middle boy even tried a bit after he heard there was courgette in it! We went the whole hog with cucumber and smoked salmon sandwiches.....washed down with a nice cuppa! I wouldn't mind eating like this every day of the week. What about you.....what is your idea of a perfect meal? I like the tradition of high tea, with crust less cucumber sandwiches, dainty cakes (to be honest none of my cakes were delicate or dainty!) and tea in a china tea-cup. Thank you for all of your thoughtful comments on my previous post....we are blessed indeed that everyone was safe and any losses will be covered by insurance. Mmmm yummy scrummy. Looked like a perfect high tea, what lucky guests! That walnut cake looks enormous, like a tower! You've given me some nice baking ideas, especially the cheese muffins, I'm licking my lips. When I get out of my sick bed the first thing I'm doing is baking! Yummy, wish you stayed closer! I do envy you, living so close to the shore. And wow, those cakes, yum! 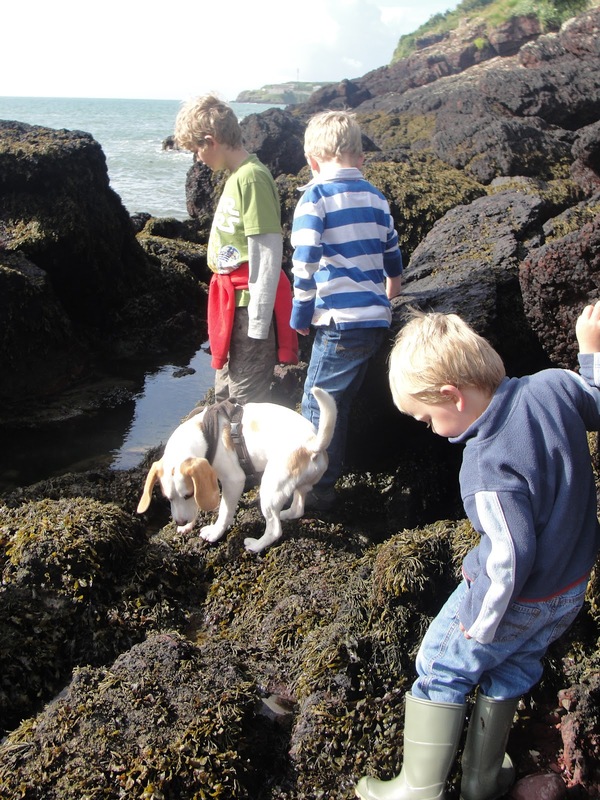 We love hunting around the rockpools too, such fun! 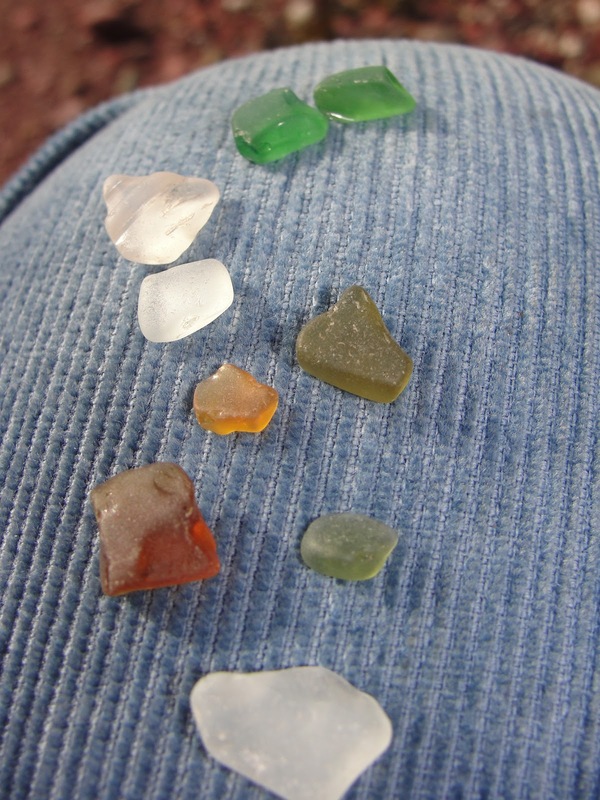 I love sea glass and always collect it :) your cake looks divine, mine ate corvette cake (with chocolate ganache mind) all summer too and there were no complaints! Your High Tea = heaven!! It is one of my faves too... In fact every 4-6 weeks myself and my 3 best girlfriends take turns in hosting a high tea. Never tried a cake with corgette in it, but I'd love to try it. It looks delish! 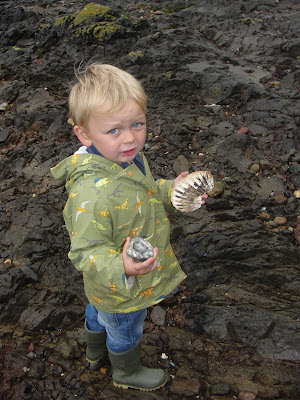 Love the pics of your boys on the beach in their wellies... We have boxes and buckets full of shells, pebbles, fossils, etc. 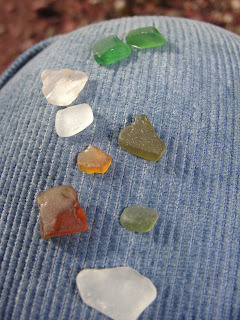 Great fun, but I think we may need to move to a bigger house to accomodate it all soon!! Your High tea certainly looks and sounds wonderful, what a great get together with your family. My idea of a perfect meal....where do I start, so many options, but I really love breakfast/brunch out with family. Good coffee, eggs benedict, a great start to the day, can't go past it really. Oh, tha tlittle guy is so cute I could just eat him up! I love the serious archeologist he's becoming! LOL! YOu never know?!?!? Your High Tea is so interesting. I've been trying to make English desserts during the Olympics and I guess I should have consulted you! What wonderful yummies with a beautiful menu to go with it!